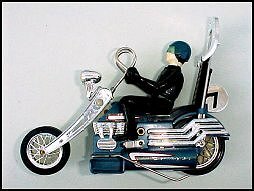 These 7-inch long custom Harley-Davidson choppers were made by Hasbro in 1971 and seemed to be a mixed tribute to both daredevil Evel Knievel and biker films like Born to be Wild and The Wild Ones. The bikes were festooned with the heads of wolves, skulls and other menacing biker memorbillia. The Easy-Riders wore black and came with removable helmets. The coolest thing about these toys were that they actually ran. Just pop in an AA battery on either side for power and for balance, flip up the kickstand which doubles as a switch and off it goes! There is also a trick wire that enables the bike to run in circles. While running, the bikes make a clicking or chattering sound, like a bike with cards in the spokes. Not quite the intimidating roar of a Harley. In fact, if you didn't know that the noise was intentional you would swear that the gears were being ground to powder. Like most toys from this period Scream'n Demons are easy to find today but not in mint condition. They rarely run and are frequently missing the windshields, riders, helmet, chrome, decals, handlebar grips and other accessories. I have also seen countless variations between bodies, sissy bars, handlebars, gas tanks and more. There is even an interesting variation in the rider. Some of the heads were fashioned after the classic molded-head GI Joe! These are exact replicas, minus the scar, of a blond GI Joe. You can spot them amongst the ordinary riders because they have redder lips and sharper features. Note: Kenner made a similar line of bikes and figures in 1976 called Wild Riders. These aren't as appealing as the Demons but are much harder to find. Lunatic Fringe - brown bike with green and white-striped awning and M-shaped handlebars. Some versions have lanterns on the sissy bar. and wolf-head. There are 2 variations in the way the double pipes are attached to the bike.